Our professional fireworks display shells come only from manufacturers that we know have spectacular effects and absolute reliability. We offer the top effects available in the industry including hearts, stars, rings, bowties, spiders, peonies, chrysanthemums, serpents, whistles, crackles, strobes, and flitters. Indoor effects include fountains, mines, comets, crossettes, waterfalls, whistles, concussions, flares, flashes, and airbursts. Stage effects are also available along with smoke, fog, and confetti. 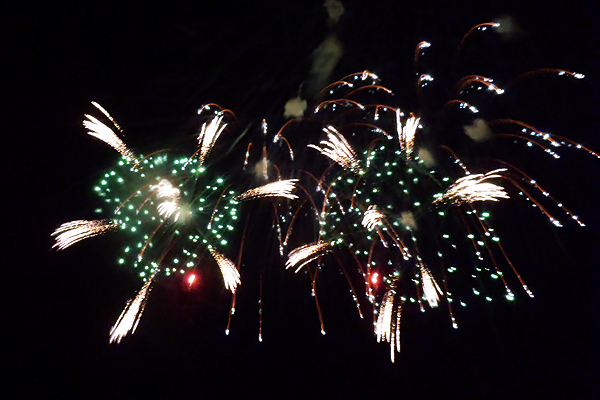 Want your or a sponsor's name spelled out in fireworks? Not a problem. We also proudly support the Pyrotechnics Guild International, an association dedicated to fireworks artistry, safety, innovation, and shell building skills. In addition to US DOT rules, we adhere to NFPA 1123, 1124, 1126 and all state and local safety regulations. Our personnel are experienced, trained and motivated toward safe operations. We also provide insurance coverage of $5 million for general liability and $5 million for transportation, using A-rated companies. We also furnish Workman's Compensation for our employees. Approaching three decades in business, the Ramsey team has years of experience operating professional fireworks displays. Clients have a high degree of comfort working with us because we are in communication with them about every aspect of a show, and we gladly accommodate any special requests. All of our Operators are graduates of and current with continuing education from the Pyrotechnics Guild International Operator Training Course. We deliver on our promises with a level of professionalism and focus that has become our trademark in the industry. One of our recent recent pyrotechnics displays demonstrates why clients choose to partner with us for their events - check it out!